Small: Waist: 27", Hips: 36"，Length: 10.2"
Medium: Waist: 28",Hips: 37",Length: 10.2"
Large: Waist: 29", Hips: 38", Length: 10.6"
X-Large: Waist: 30", Hips: 39",Length: 10.6"
2X-Large: Waist: 31", Hips: 40",Length: 11"
3X-Large: Waist: 32", Hips: 41",Length: 11"
Notice: Please allow 0.4"- 0.8" due to manual measurement, thanks! High waisted design shows off your waistline, covers up your muffin top and tummy. Featuring self-tie laces on sides, you could lace them from bottom to top or lace them the opposite way as you like. Do hope customers will not complain about the lacing not being done, since it gives you the option to list them as you please, makes each pair unique in individualistic. Material: Denim cotton blended.Soft and comfortable to wear. Featuring self-tie laces on sides, you could lace them from bottom to top or lace them the opposite way as you like.Do hope customers will not complain about the lacing not being done, since it gives you the option to list them as you please, makes each pair unique in individualistic. 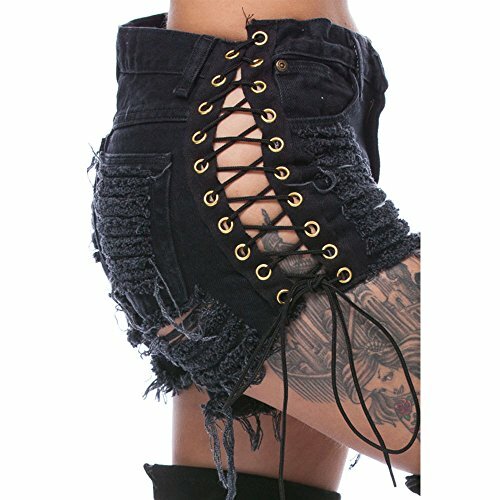 It is cool and Fashionable To Wear Such a Destroyed Shorts;Fashion look,perfect for for Dancing, Raves, Festivals, Parties, Nightclub and Casual Wear.Perfert for daily wear, casual wear ect. If you have any questions about this product by Olyha, contact us by completing and submitting the form below. If you are looking for a specif part number, please include it with your message.